Long before it became the commercialized mass information and entertainment juggernaut it is today, long before it was accessible to the general public, and certainly many years before Al Gore claimed he “took the initiative in creating” it, the Internet – and its predecessors – were a focal point for social interactivity. Granted, computer networking was initially envisioned in the heyday of The Beatles as a military-centric command and control scheme. But as it expanded beyond just a privileged few hubs and nodes, so too did the idea that connected computers might also make a great forum for discussing mutual topics of interest, and perhaps even meeting or renewing acquaintances with other humans. In the 1970s, that process began in earnest. Mullets reigned supreme in the late ‘70s and early ‘80s; computers were a far rarer commodity. Machine languages were bewildering, and their potential seemingly limited. What’s more, this whole sitting-in-front-of-a-keyboard thing was so… isolationistic. Put all this together and you have a medium where only the most ardent enthusiasts and techno-babbling hobbyists dared tread. It was, in effect, a breeding ground for pocket-protector-wearing societal rejects, or nerds. Boring, reclusive nerds at that. Yet it also was during this time, and with a parade of purportedly antisocial geeks at the helm, that the very gregarious notion of social networking would take its first steps towards becoming the omnipresent cultural phenomenon we know and love in 2014. It started with the BBS. Short for Bulletin Board System, these online meeting places were effectively independently-produced hunks of code that allowed users to communicate with a central system where they could download files or games (many times including pirated software) and post messages to other users. Accessed over telephone lines via a modem, BBSes were often run by hobbyists who carefully nurtured the social aspects and interest-specific nature of their projects – which, more often than not in those early days of computers, was technology-related. Moreover, long distance calling rates usually applied for out-of-towners, so many Bulletin Boards were locals-only affairs that in turn spurred local in-person gatherings. And voila, just like that, suddenly the antisocial had become social. The BBS was no joke. Though the technology of the time restricted the flexibility of these systems, and the end-user’s experience, to text-only exchanges of data that crawled along at glacial speed, BBSes continued to gain popularity throughout the ‘80s and well into the ‘90s, when the Internet truly kicked into gear. Indeed, some services – such as Tom Jennings’ FidoNet – linked numerous BBSes together into worldwide computer networks that managed to survive the Internet revolution. But there were also other avenues for social interaction long before the Internet exploded onto the mainstream consciousness. 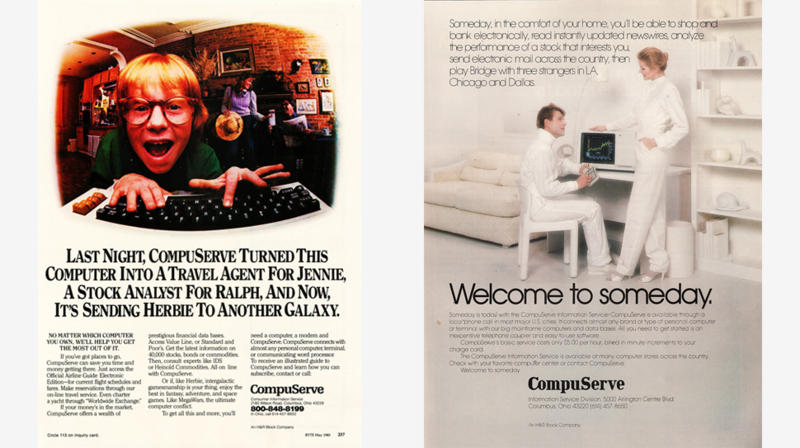 One such option was CompuServe, a service that began life in the 1970s as a business-oriented mainframe computer communication solution, but expanded into the public domain in the late 1980s. CompuServe allowed members to share files and access news and events. But it also offered something few had ever experienced – true interaction. Not only could you send a message to your friend via a newfangled technology dubbed “e-mail” (granted, the concept of e-mail wasn’t exactly newfangled at the time, though widespread public access to it was). You could also join any of CompuServe’s thousands of discussion forums to yap with thousands of other members on virtually any important subject of the day. Those forums proved tremendously popular and paved the way for the modern iterations we know today. But if there is a true precursor to today’s social networking sites, it was likely spawned under the AOL (America Online) umbrella. In many ways, and for many people, AOL was the Internet before the Internet, and its member-created communities (complete with searchable “Member Profiles,” in which users would list pertinent details about themselves), were arguably the service’s most fascinating, forward-thinking feature. Yet there was no stopping the real Internet, and by the mid-1990s it was moving full bore. Yahoo had just set up shop, Amazon had just begun selling books, and the race to get a PC in every household was on. 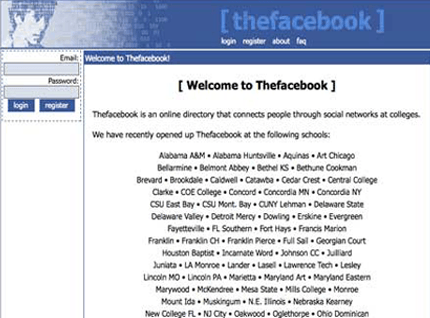 And, by 1995, the site that may have been the first to fulfill the modern definition of social networking was born. 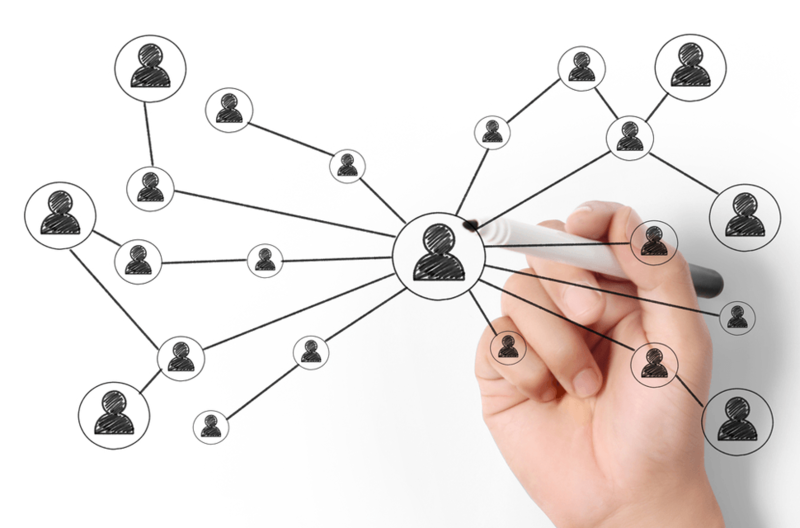 Though differing from many current social networking sites in that it asks not “Who can I connect with?” but rather, “Who can I connect with that was once a schoolmate of mine?” Classmates.com proved almost immediately that the idea of a virtual reunion was a good one. Early users could not create profiles, but they could locate long-lost grade school chums, menacing school bullies and maybe even that prom date they just couldn’t forget. It was a hit almost immediately, and even today the service boasts some 57 million registered accounts. 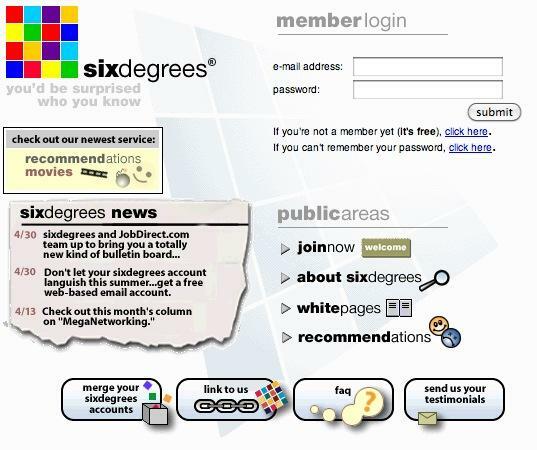 One of the first iterations of SixDegrees.com. That same level of success can’t be said for SixDegrees.com. Sporting a name based on the theory somehow associated with actor Kevin Bacon that no person is separated by more than six degrees from another, the site sprung up in 1997 and was one of the very first to allow its users to create profiles, invite friends, organize groups, and surf other user profiles. Its founders worked the six degrees angle hard by encouraging members to bring more people into the fold. Unfortunately, this “encouragement” ultimately became a bit too pushy for many, and the site slowly devolved into a loose association of computer users and numerous complaints of spam-filled membership drives. SixDegrees.com folded completely just after the turn of the millennium. Other sites of the era opted solely for niche, demographic-driven markets. One was AsianAvenue.com, founded in 1997. A product of Community Connect Inc., which itself was founded just one year prior in the New York apartment of former investment banker and the future Community Connect CEO, AsianAvenue.com was followed by BlackPlanet.com in 1999 and by the Hispanic-oriented MiGente.com in 2000. All three still exist today, with BlackPlanet.com in particular still enjoying tremendous success with more than eight million visitors per month. In 2002, social networking hit really its stride with the launch of Friendster. Friendster used a degree of separation concept similar to that of the now-defunct SixDegrees.com, refined it into a routine dubbed the “Circle of Friends,” and promoted the idea that a rich online community can exist only between people who truly have common bonds. And it ensured there were plenty of ways to discover those bonds. An interface that shared many of the same traits one would find at an online dating site certainly didn’t seem to hurt. 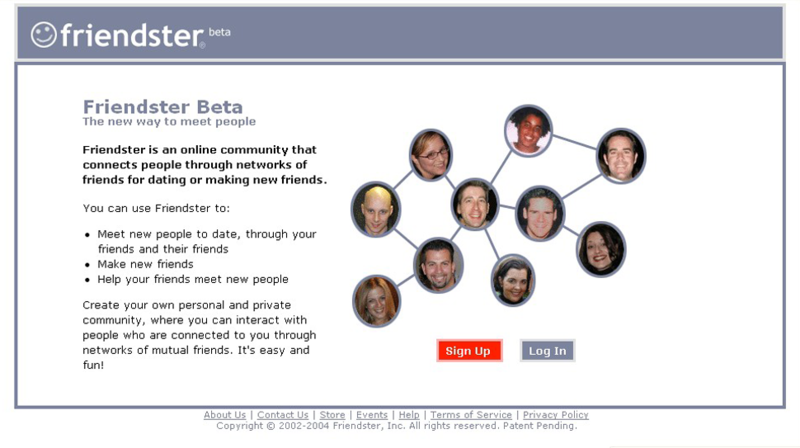 Friendster CEO Jonathan Abrams even once referred to his creation as a dating site that isn’t about dating. Within a year after its launch, Friendster boasted more than three million registered users and a ton of investment interest. Unfortunately, the service has since seen more than its fair share of technical difficulties, questionable management decisions, and a resulting drop in its North American fortunes. Although briefly enjoying success in Indonesia and in the Philippines, Friendster has since abandoned social networking and now exists solely as an online gaming site. Introduced just a year later in 2003, LinkedIn took a decidedly more serious, sober approach to the social networking phenomenon. Rather than being a mere playground for former classmates, teenagers, and cyberspace Don Juans, LinkedIn was, and still is, a networking resource for business people who want to connect with other professionals. In fact, LinkedIn contacts are referred to as “connections.” Today, LinkedIn boasts more than 297 million members. MySpace also launched in 2003. Though it no longer resides upon the social networking throne in many English-speaking countries – that honor now belongs to Facebook just about everywhere – MySpace was once the perennial favorite. It did so by tempting the key young adult demographic with music, music videos, and a funky, feature-filled environment. It looked and felt hipper than major competitor Friendster right from the start, and it conducted a campaign of sorts in the early days to show alienated Friendster users just what they were missing. Over the years however, the number of casual Myspace users declined, and today the site exists now as a social networking site targeted to bands and musicians. As expected, the ubiquitous Facebook now leads the global social networking pack. 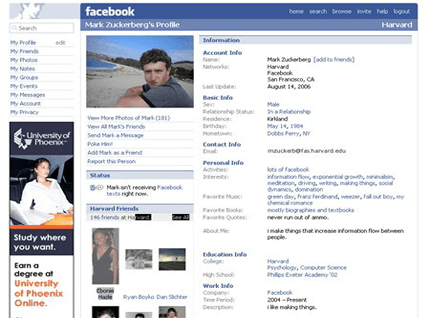 Founded, like many social networking sites, by university students who initially peddled their product to other university students, Facebook launched in 2004 as a Harvard-only exercise and remained a campus-oriented site for two full years before finally opening to the general public in 2006. Yet, even by that time, Facebook was considered big business. So much so that, by 2009, Silicon Valley bigwigs such as Paypal co-founder and billionaire Peter Thiel invested tens of millions of dollars just to see it flourish. The secret of Facebook’s success — the site currently boasts more than 1.3 billion active users — is a subject of much debate. Some point to its ease of use, others to its multitude of easily-accessed features, and still others, to its memorable name. A highly targeted advertising model certainly doesn’t hurt, either, nor did financial injections such as the $60 million from noted Hong Kong tycoon Li Ka-shing in 2007. Regardless, there’s universal agreement on one thing: Facebook promotes both honesty and openness. It seems people really enjoy being themselves, and throwing that openness out there for all to see. Facebook is king for a reason. It wasn’t just through luck that founder Mark Zuckerberg’s darling came to reign supreme over the social media kingdom. It was, in fact, a series of smart moves and innovative features that set the platform apart from the rest of the social media pack. 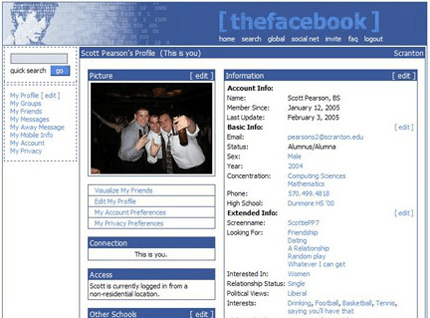 First and foremost, the 2007 launch of the Facebook Platform was key to site’s success. The open API made it possible for third-party developers to create applications that work within Facebook itself. Almost immediately after being released, the platform gained a massive amount of attention. At one point in time, Facebook had hundreds of thousands of apps built on the platform, so many that Facebook launched the Facebook App Store to organize and display them all. Twitter, meanwhile, created its own API and enjoyed similar success as a result. DT’s early hands-on with Google+. The other key to success was Facebook’s ubiquitous ‘Like’ button, which broke free from the bounds of the site and began appearing all over the Internet. Now you can ‘like’ or “tweet’ just about everything even when you’re not on Facebook or Twitter. 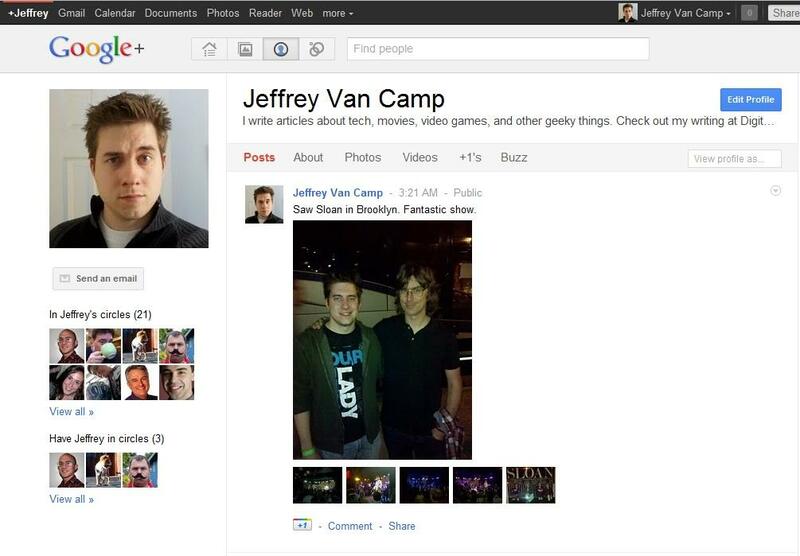 Realizing the power of social networking, Google decided to launch their own social network (Google+) in 2007. It differed from Facebook and Twitter in that it wasn’t necessarily a full-featured networking site, but rather a social “layer” of the overall Google experience. Initially, Google generated a lot of buzz with the service’s Hangouts feature, which allowed users to enter live video chats with other online friends. At the time of launch, Facebook was scrambling to keep up by integrating a video chat feature of their own. Within just four weeks, Google+ had garnered 25 million unique visitors, with as much as 540 million active monthly users as of June 2014. Regardless, the service definitely didn’t dethrone Zuckerberg’s behemoth, especially considering more than half of Google+ users have never even visited the service’s official site. It still arguably showed the world that there was still room for innovation and competition in the realm of social networking, though. Over the course of the past two years, “Fourth screen” technology — smartphones, tablets, etc. — has changed social networking and the way we communicate with one another entirely. What used to sit on our desks now conveniently fits in the palm of our hands, allowing us to effortlessly utilize functionality once reserved for multiple devices wherever we go. Given the abrupt rise in mobile computing, it’s not surprising the most popular social media platforms of the past several years hinge on the capabilities of smartphones. Photo and video-sharing applications such as Snapchat and Instagram, the latter of which has now garnered a staggering 20 billion images since the app’s initial inception in October 2010, exist almost entirely on mobile. The same goes with platforms such as Foursquare, an application in which users use their smartphones to check in to various locations around the globe, and various matchmaking services. Tinder, for instance, currently boasts more than 10 million daily users, each of which swipes for potential partners based on their approximately in relation to their smartphone. Mobile-based platforms also approach social networking in an entirely different fashion than their Web-based counterparts. Rather than offering a comprehensive social networking experience like the now-defunct Myspace and the struggling Google+, they instead specialize in a specific kind of interaction service that involves the sharing of public images (Instagram), the private sharing of images sharing (Snapchat), augmented reality (Foursquare), and location-based matchmaking (Tinder). People essentially use the various services in conjunction with other platforms to build a comprehensive, digital identity. Indeed social media companies no longer see the market as strictly zero-sum, or at least that’s what Zuckerberg continues to say in public. The registration process for hundreds of applications such Snapchat, Instagram, Foursquare, and Tinder can be completed using already-existing Facebook, Gmail, or Twitter accounts. Furthermore, a number of platforms allow users to simultaneously post content using several platforms at once. Again, people now exist on multiple platforms, and instead of fighting against this trend, larger companies are tapping into this new environment. In March 2014, Facebook acquired Oculus VR, a company on the cusp of mass producing virtual-reality headsets. Upon sealing the deal, Zuckerberg commented regarding the communication potential for the platform, highlighting the slew of potential uses for the virtual technology when it comes to academics, viewing live events, and consulting with doctors face-to-face. However, Facebook has taken a hands-off approach in its management of Oculus VR, allowing the company to continue focusing predominately on gaming applications while other parties — i.e. the Pentagon — quietly look into using virtual reality headsets for military purposes. A number of medical experts have even begun using virtual reality to treat anxiety, combat-induced P.T.S.D., and other pronounced mental illnesses. 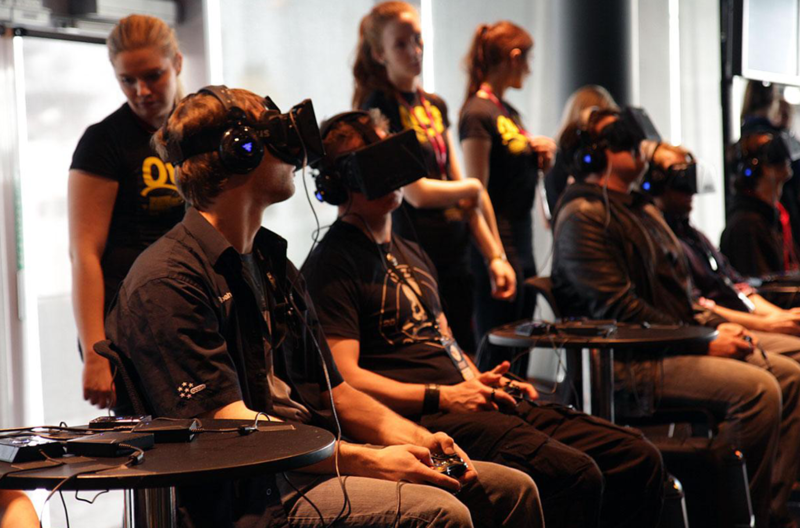 Adult entertainment, meanwhile, has invested in virtual reality for years. To simplify my point, it appears a good deal of people have high hopes that virtual reality will become the next blockbuster computing platform. The technology already exists, and with the consumer version of the Oculus Rift VR headset slated to go on sale in late 2014 for under $300, the potential for widespread adoption of virtual reality has never been greater. At the very least, the Rift’s success or failure in the market will shape Facebook’s approach toward incorporating virtual reality. Note that augmented reality differs from virtual reality in that it applies digital interaction to the real world instead of creating an audio-visual experience from scratch. In terms of social networking, augmented reality offers a number of possibilities. For instance, people could share their name, interests, relationship status, and mutual friends all within a digital sphere. Believe it or not, augmented reality already exists in apps like Yelp and Google Ingress. Smartphones are more than capable of delivering augmented reality, and as one might expect, the technology is the entire concept driving Google Glass’ digital integration with the real world. 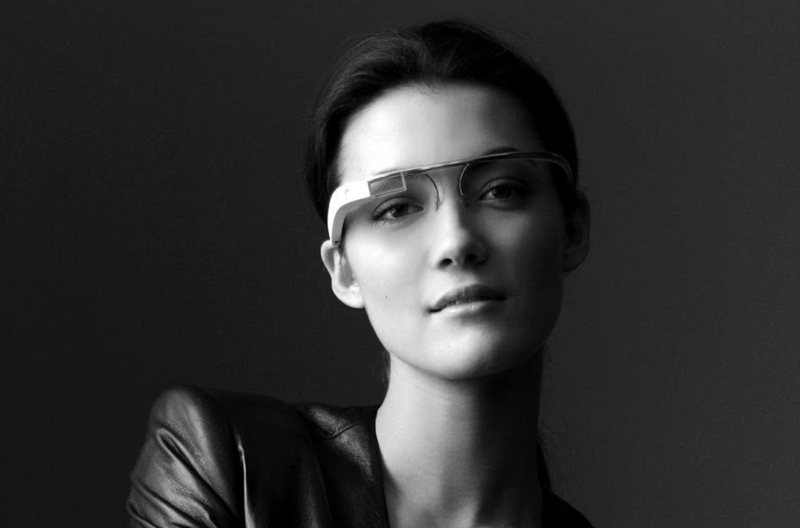 Google’s deliberate decision to sell Glass at an inflated price of $1,500, however, is likely meant to exclude the general public while the tech giant and a selective group of consumers — aka “explorers” work to hammer out the device’s flaws. The day Google lowers the price of Glass to its estimated production cost of $150 marks the day when widespread adoption of augmented reality, including augmented reality in social networking, becomes a greater possibility. Until then, there’s always Snapchat and the overuse of hashtags in just about everything we do. Fueled by the rise of third-party apps, social media giants were forced to take note of the video format by 2012. But not before that same format, in a different guise, had laid waste to any form of originality on their respective services. A spending spree followed. Within the span of just a couple of years, several major buyouts —and failed acquisition attempts — took place within the sector. In 2012, Twitter purchased video-looping platform, Vine. Later that same year, Facebook bought Instagram, which would eventually introduce video-sharing into its own app app to great success. Then in 2013, Facebook made its infamous bid for Snapchat, which was turned down by the makers of the ephemeral messaging app. Meanwhile, the video-shaped void on Facebook and Twitter had been filled by new media companies that were experts in the art of viral content (i.e. BuzzFeed, 9GAG, Mashable). An earlier source had been YouTube, which had heralded the dawn of the internet celebrity with its homegrown roster of creators. Despite their popularity, however, viral videos posed more complications for social media giants than they did opportunities. Left to operate independently, both Instagram and Vine proved to be solid investments. Their respective owners, however, were still facing the same issue. By 2015, Twitter was being labelled as “inaccessible” due to its flat growth in user numbers. Facebook, on the other hand, saw its users sharing less personal information. Instead of original posts, Facebook news feeds and Twitter timelines became bloated with viral videos, memes, GIFs, and clickbait articles — making them harder to navigate in the process. As in the past, the perceived solution came from an existing product, which ended up paying the ultimate price for its abrupt rise. Having dominated the conversation at the 2015 SXSW Interactive festival, livestreaming app Meerkat caught the attention of Twitter. Capitalizing on what it viewed as an emerging trend, Twitter bought rival livestreaming app Periscope just a few months later. 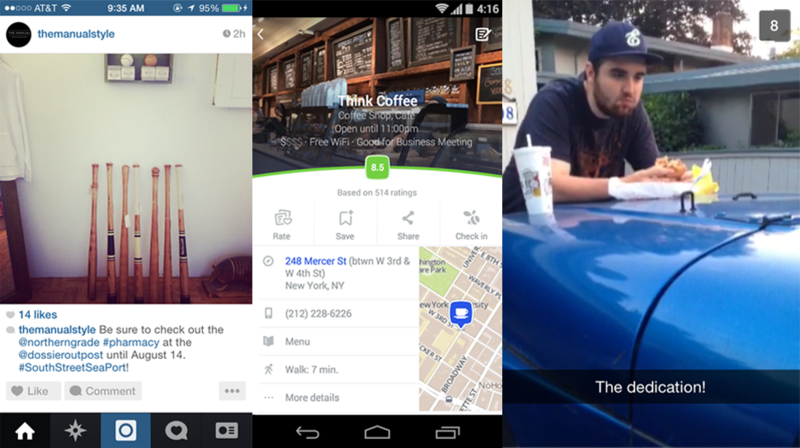 It has since integrated Periscope streams into its main platform, in an attempt to further popularize the app. Fast forward a few months to the end of 2015, and Facebook inevitably followed suit with the launch of Live Video. Overshadowed by its rivals, Meerkat quickly quickly abandoned livestreaming altogether. It is easy to see the attraction live broadcasts hold for social networks. Like viral videos, livestreams have the unique benefit of making viewers feel like they are ‘in the moment.’ A popular livestream has a snowball effect and, in turn, can quickly become a trending topic. Like the immediacy offered by Snapchat, the format can transform the mundane into the unmissable. Best of all, it allows social networks to lay claim to something original, which now autoplays on its flagship platform. The integration of the livestream on Twitter and Facebook has also made the two companies more open to striking broadcast deals with third-parties. In turn, having seen the success that BuzzFeed and its counterparts have had with video, both traditional and new media companies have been quick to embrace Periscope and Facebook Live. Nowhere is this theory better evidenced than Twitter’s recent deal to livestream NFL games. This compromise on the part of the social media giants comes in the wake of the realization that they can no longer be relegated to the second, third, or fourth screen. They have to be the main attraction by showcasing viral, trending, or popular visual media — whether original or not — in real-time, fueling interaction and reaction in the process. This article was originally published on August 5, 2014, and updated on May 4, 2016, by Saqib Shah to reflect the widespread adoption of video-sharing platforms and livestreaming.